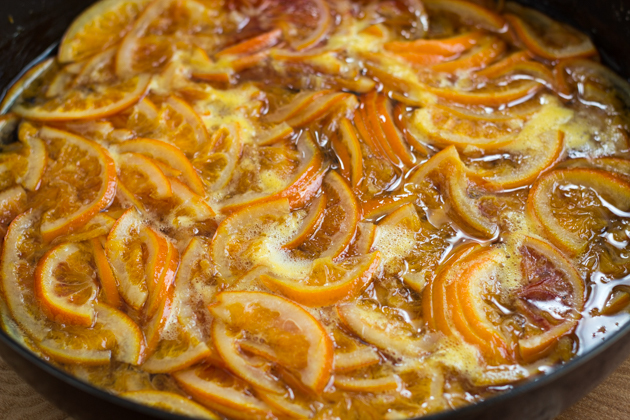 The first thing you will notice about candied oranges is that they are beautiful. 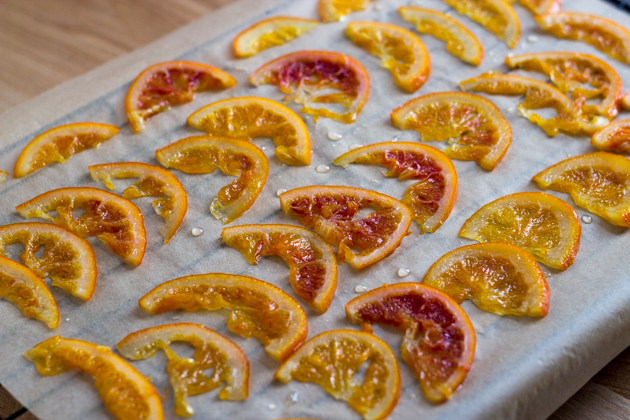 The oranges are cut in half moons and the candied segments look like edible stained glass. 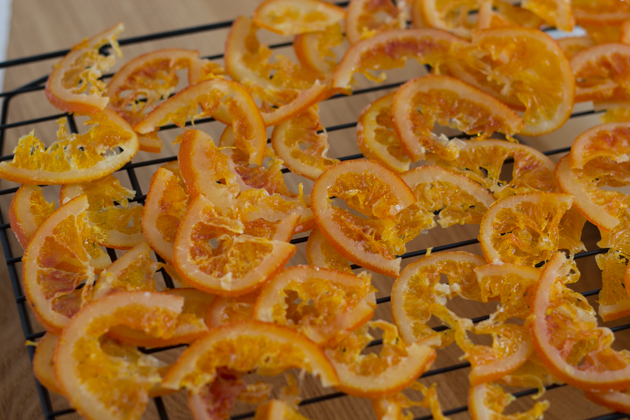 They are delicious candied and dried without decadently dipping them in chocolate. I make a huge batch when I make these, placing them in beautiful bags and boxes tied with ribbon and give them as gifts or place them in Christmas stockings. 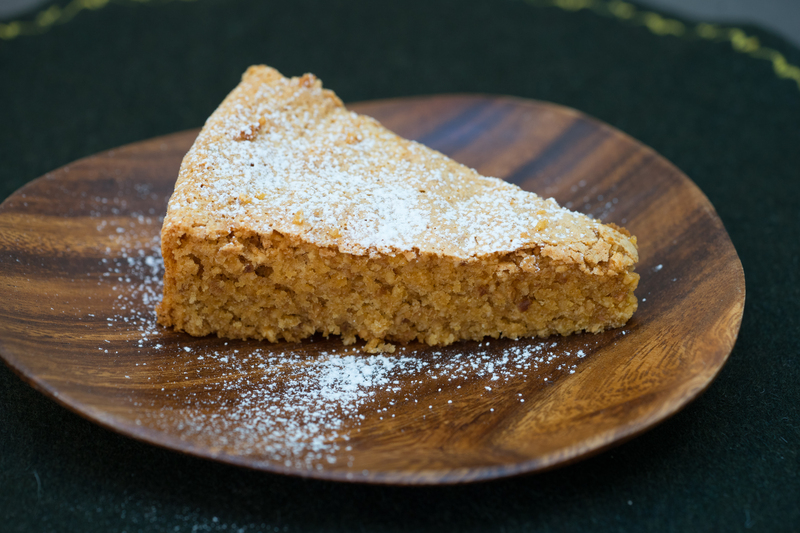 Unlike Christmas biscuits and cake, they are dairy and gluten-free so can be given to everyone. 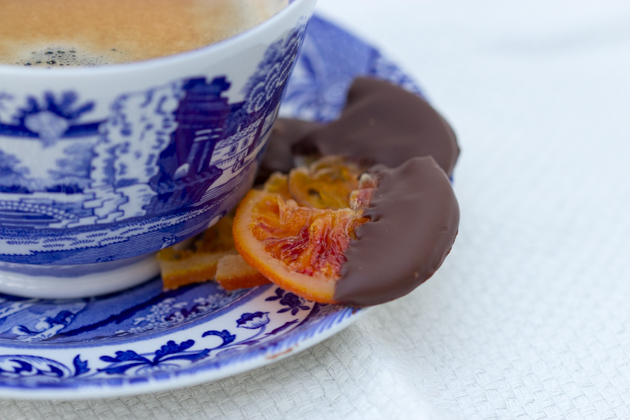 When guests come over, I serve them with coffee and tea at the end of a meal. 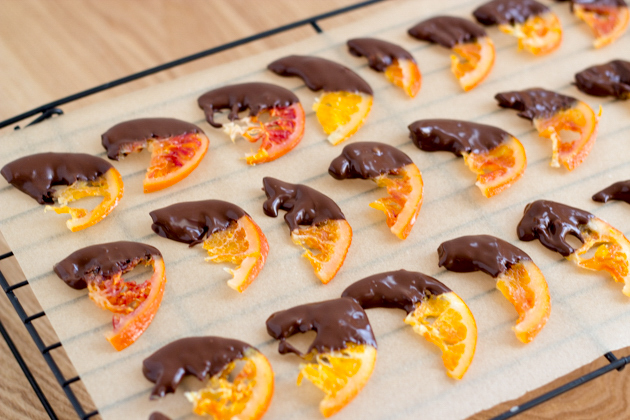 My sons love dipping the oranges in chocolate and eating them. I feel better about giving them these (with a tiny bit of chocolate) than I do other sweets. 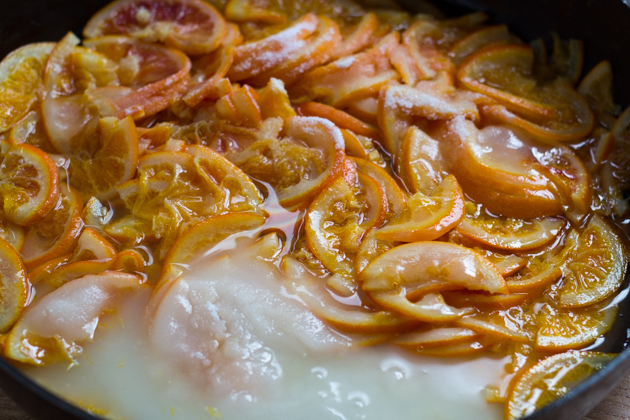 The oranges are cooked in several changes of sugar water to remove the bitterness of the white pith. 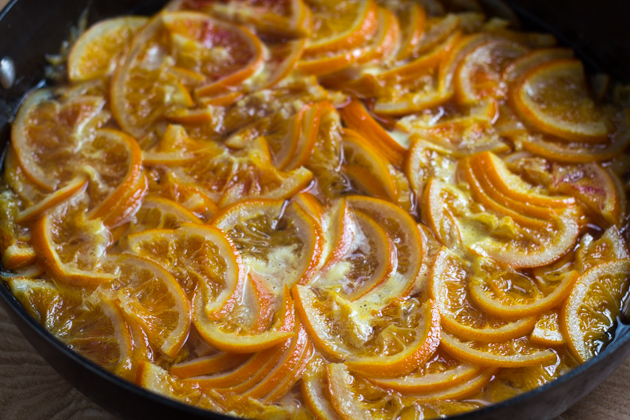 Be gentle when cooking the oranges to as to preserve the segments. 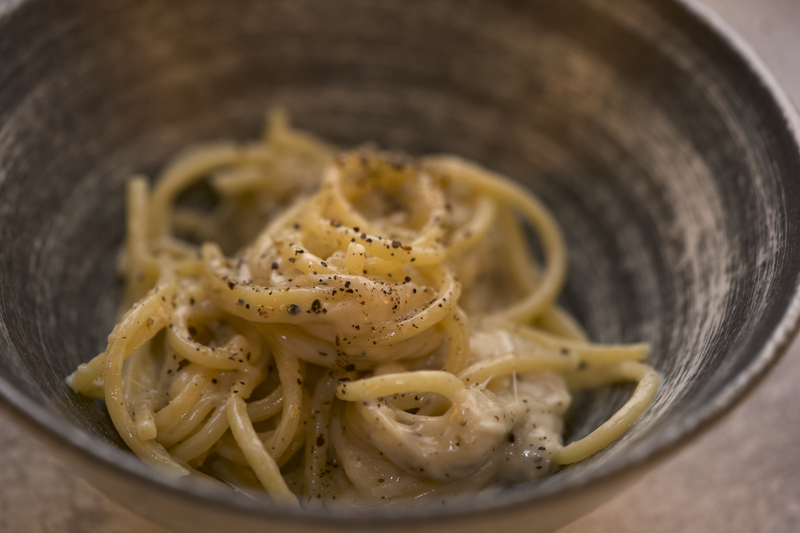 They take a few days to dry out so start this recipe a few days in advance of when you need them. Chocolate is notoriously difficult to temper. I use the seeding method here which is simpler than the traditional method which is best for larger batches of chocolate. 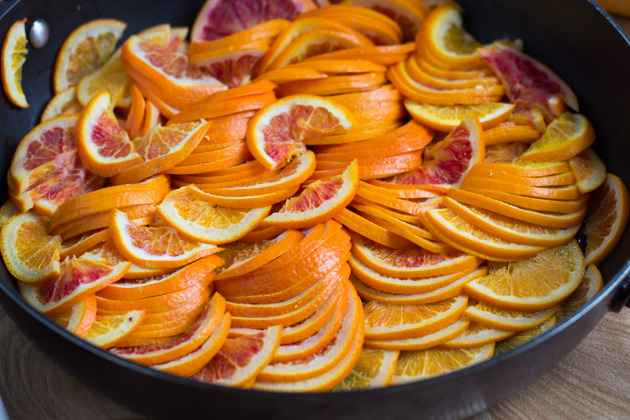 Cut oranges in half and finally slice them. 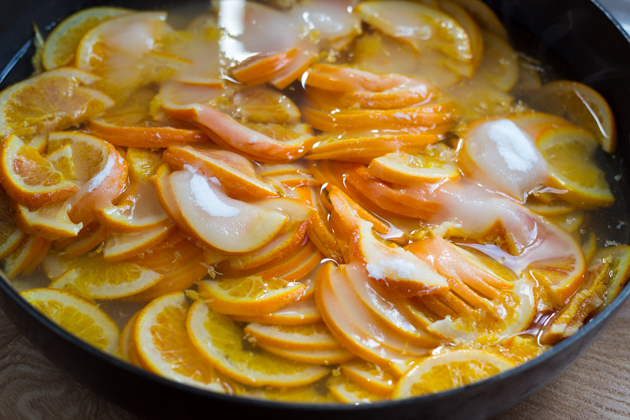 Place the oranges in the largest sauté pan you have and cover with cold water. Bring the water to a boil and boil for 3 minutes. Drain gently and repeat two more times. 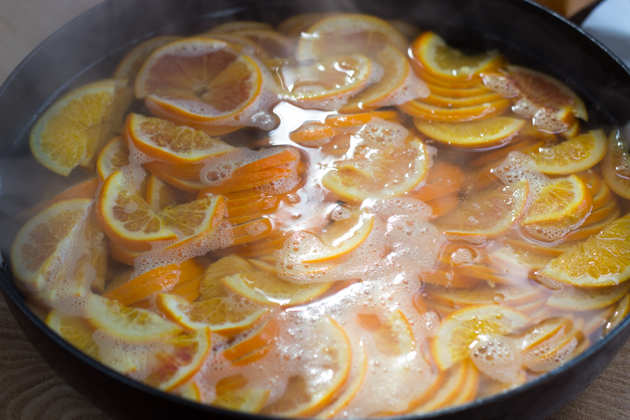 Add 500 grams sugar to the oranges and add 550 mls water. Drain the syrup and add 500 grams sugar and 200 mls water and cook for 15 minutes. Place sheets of parchment on top of wire racks. 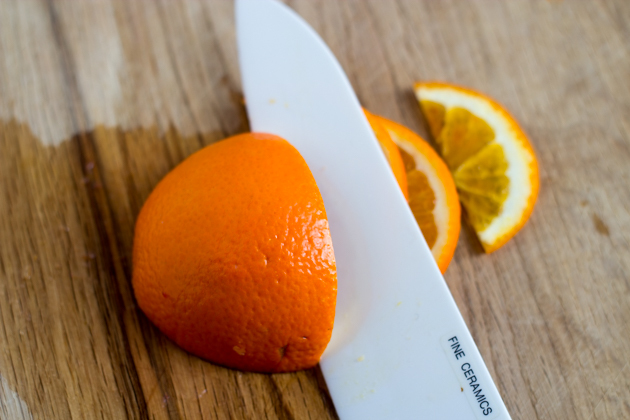 Use a fork, chopsticks or tongs to place the slices of orange onto the parchment and let dry for 3 days until no longer sticky. They will need to be turned occasionally and when stiff enough they can be placed directly onto the wire rack to speed up their drying. The chocolate needs to be tempered to align the cocoa butter crystals in the chocolate. When chocolate is tempered properly it will be shiny and snap when broken. If it is not tempered properly it will be dull and/or streaky and be more pliable in texture. 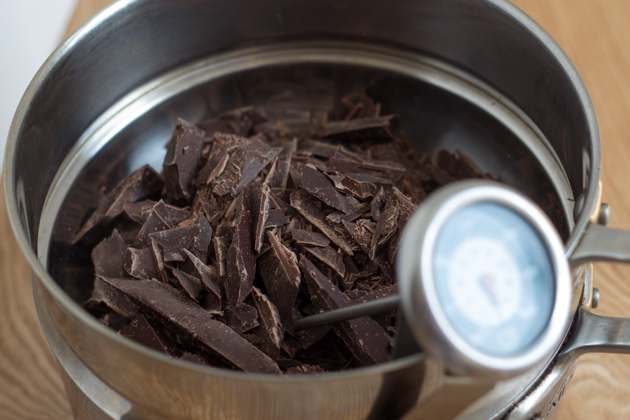 To see an illustrated step-by-step guide to tempering chocolate by seeding, please see here. 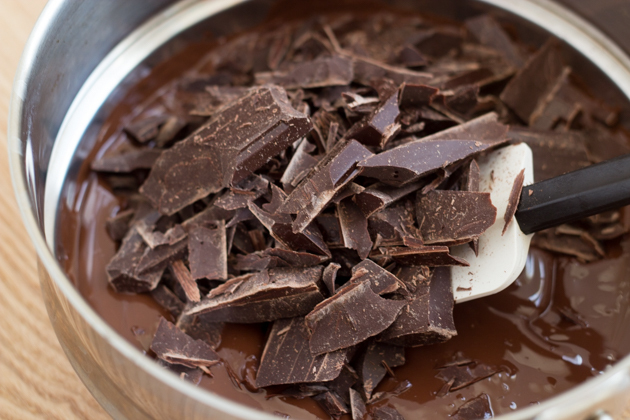 Place 230 grams of chocolate in a bain marie or a bowl of water which tightly fits over a saucepan and set aside. 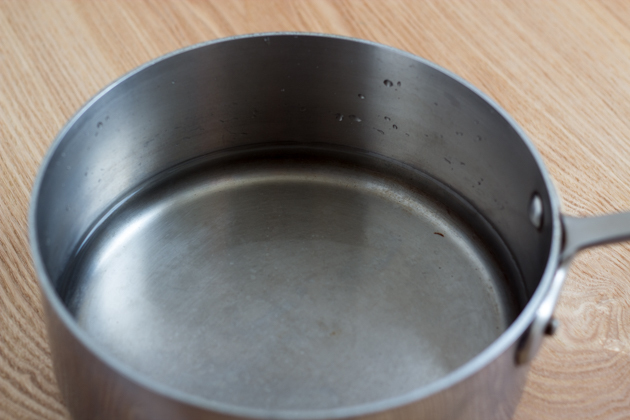 In the saucepan, bring 3 cm of water to boil ensuring that the level of water will not touch the bottom of the bowl and turn off the heat. Water and steam will make the chocolate seize. Place the bowl with the chocolate over the saucepan of boiling water. 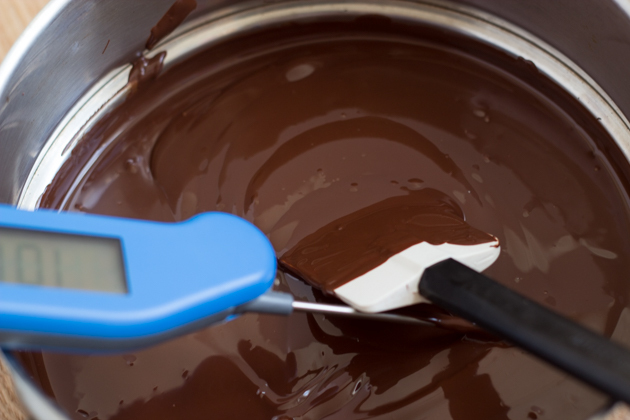 Use a thermometer to be certain of the temperature and stir the chocolate until it reaches 50-55C. Make sure it does not exceed 55C. 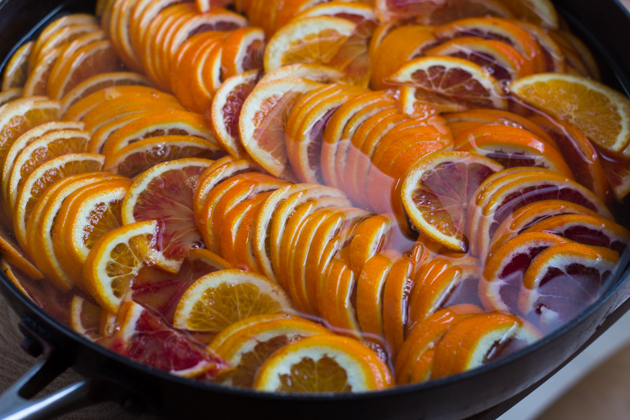 Once it reaches the correct temperature, remove the bowl from the boiling water and place it on a tea towel. 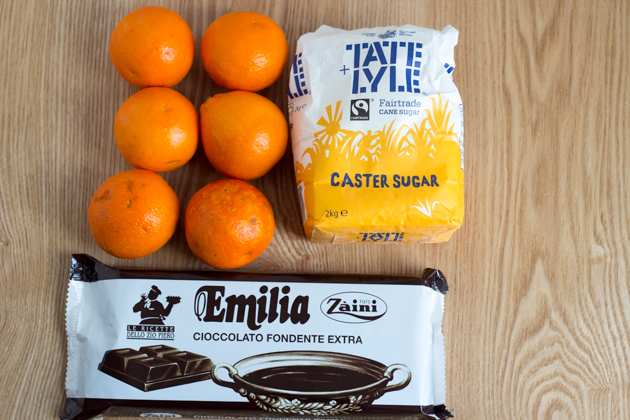 Stir in the remaining 150 grams of chocolate. When the temperature reaches 31-32C the chocolate is ready (do not allow it to go over 32C). 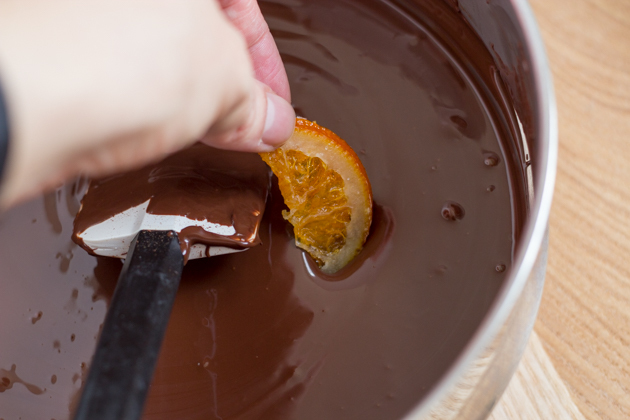 Dip one of the oranges into the chocolate and let it come to room temperature and see if it streaks. 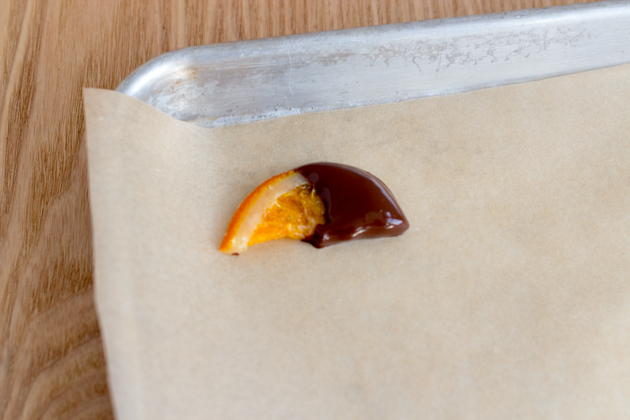 If it doesn’t streak, work quickly to dip the orange segments in the chocolate halfway. 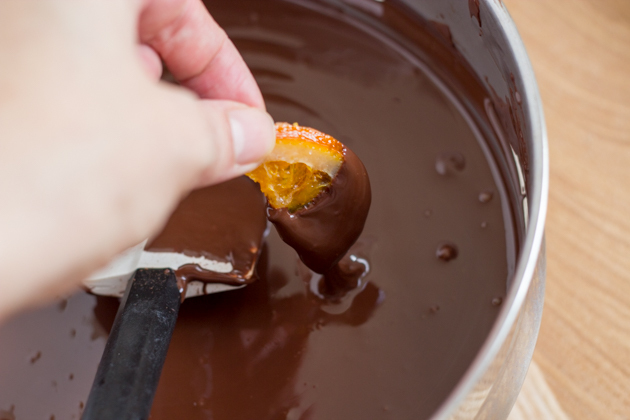 When removing the orange from the chocolate dip the tip of it 3 times to remove any excess chocolate so that it does not pool. Place the segments on the paper lined tray so that they do not touch. Let the chocolate harden and then they are ready to serve. 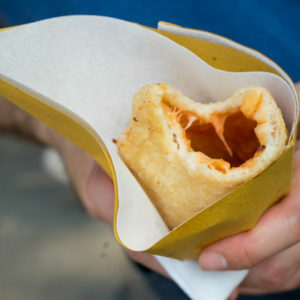 They can be placed in a sealed container, layered between sheets of parchment for up to 3 months.